Written by Fairfield Fire Dept. 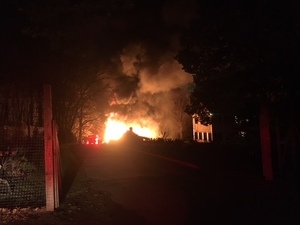 Fairfield, CT - On Tuesday, December 4, at 4:52 am, the Fairfield Fire Department Telecommunications Center received a call from a resident reporting a chicken coop barn on fire at 360 Mine Hill Road in Fairfield. Engine 5, the first arriving unit led by LT Mark Harry, reported heavy smoke and fire coming from an approximate 5,500-square-foot two-story structure, with fire exposing to an adjacent occupied home. Engine 5 initiated an aggressive exterior attack on the fire while simultaneously searching the adjacent structure. A male occupant was rescued from the exposed structure and led to safety by Fairfield Fire personnel. The rescued male reported no injuries. The family was found outside of the main house, approximately 100 feet from the fire building and reported a minor injury sustained while attempting to release chickens from the fire building. AMR paramedics were called to the scene to evaluate the involved persons. 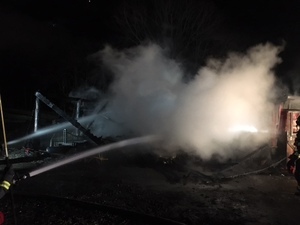 Due to the barn style of construction, stored fuels and propane tanks, the fire quickly spread throughout the structure, resulting in a collapse of the second floor. Firefighters were unable to enter the building, but were able to apply cooling water to propane tanks located in the building to avoid an explosion. 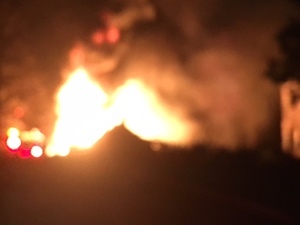 A total of five engines, two truck companies and a command car initially responded to the incident and brought the fire under control in approximately 30 minutes. 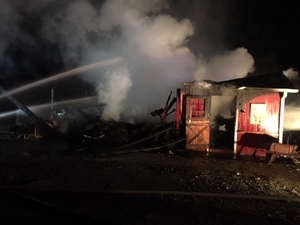 The Chief, Deputy Chief, Safety Officer and Fire Marshal were called to the scene to support operations along with Connecticut DEEP, and Town of Fairfield building and health officials. In addition, units from Westport and Bridgeport fire departments were called to provide mutual aid coverage to Fairfield's fire stations. 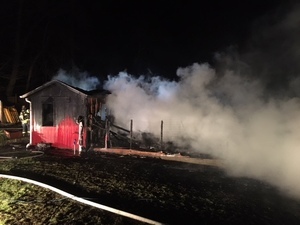 Assistant Chief Roger Caisse, the Incident Commander stated, "The quick actions of the first arriving engine company prevented the loss of life to the occupant who was asleep and unaware of the fire. Fires like this should serve as a reminder about the importance of having working smoke detectors to alert occupants and an established meeting place outside in the event of a fire." No Firefighter injuries were reported from the scene. The cause of the fire remains under investigation by the Fairfield Fire Marshal's Office.